I didn't even realize how busy June was, until it was over. I never meant to miss an entire month of blogging. I'm pretty sure it is the first time I've ever done that in 5+ years of blogging. 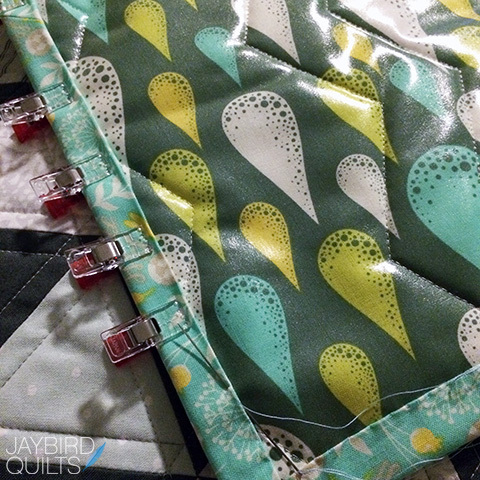 I did a good amount of sewing in June & posted much of it to Instagram. One of my favorite things that I made was placemats for our new table. During my studio re-organization I pulled out my Tula Pink stash. 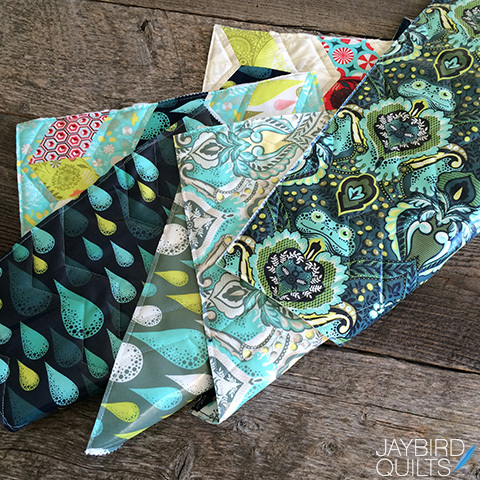 These Prince Charming fabrics spoke to me and I decided to start cutting diamonds from my Sidekick Ruler. Initially I didn't actually have a plan. 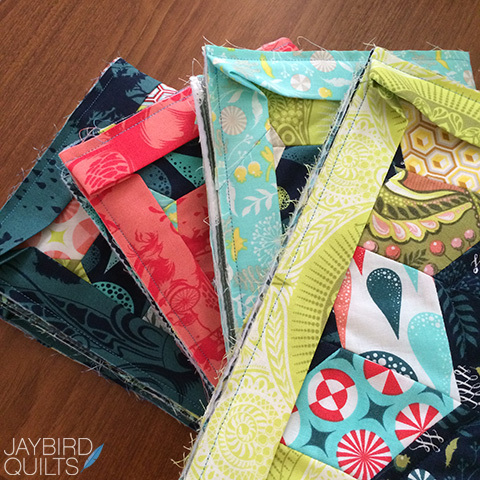 By day #2 I had decided to make scrappy placemats based on my Seaside Table Runner pattern. 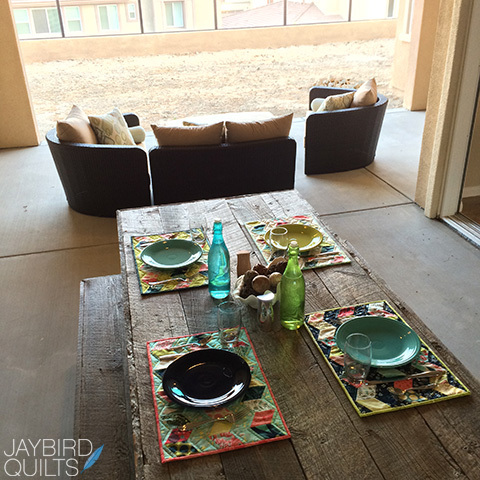 I used a different background fabric for each of the placemats. Each one is quilted with 6 lines that echo the zig zag in the design. I decided to put Prince Charming Laminated Cotton fabrics on the back of each one for easy clean up. 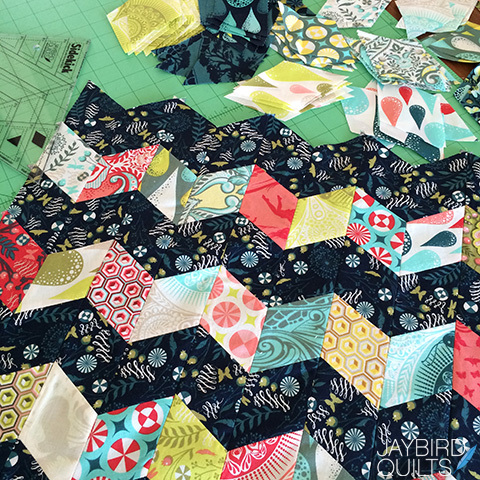 I considered binding them all in the same fabric, and then decided to keep it scrappy and mix it up. I'm glad I did because I love the result! Binding through Laminated Cotton isn't the most fun. 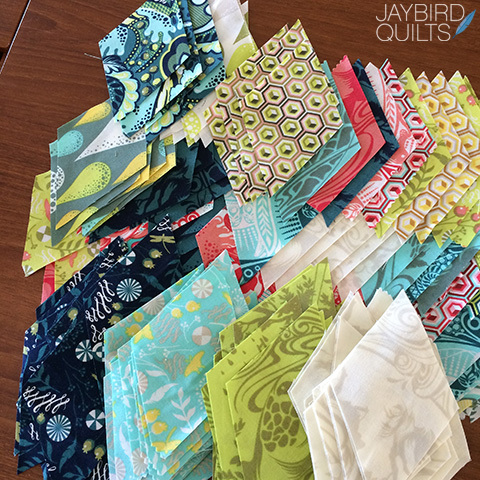 It takes patience and I did consider binding these by machine more than once. I finished them just in time to set the table and have some friends over for dinner. I love how they all go together with out matching! What about flipping the binding --Machine sewing the binding onto the laminate and whip stitch to the cotton patchwork. They are lovely. And they are gorgeous with your dishes! I love Tula Pink and it is so difficult to find complete ranges here in the UK. Your placemats are a fabulous pop of colour. Love them! These are so fantastic! I love how each one is different! Really gorgeous! they look fantastic on your table! 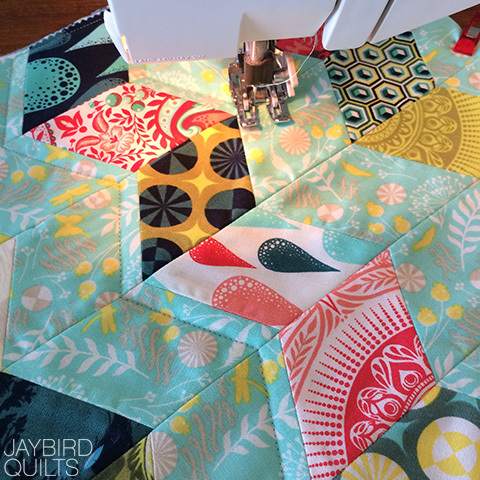 Love the placemats and the Sidekick ruler, currently working on my second Rock Candy topper - making a pillow instead. 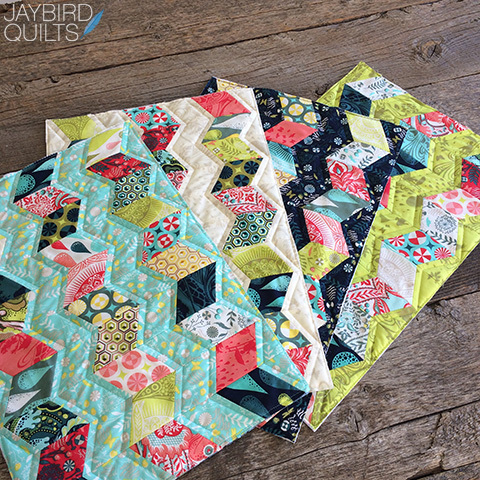 You did have a busy month last month....what ever happened with the Jaybird Quilts Quilt Along at Sew Sweetness' blog?? Wow. I love how great the prints all look together. They are wonderful and look so nice together! The placemats look amazing!I would love to try them one day. Great to see you blogging again! Love your work. 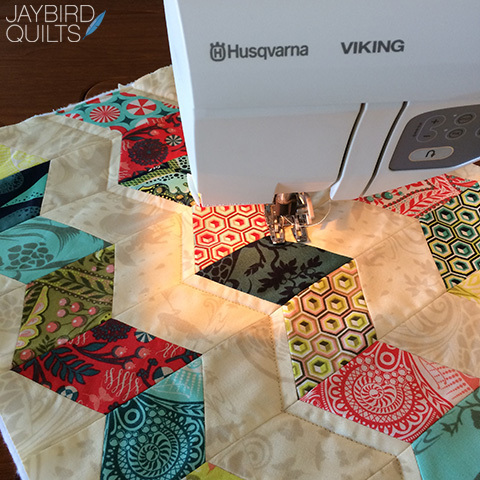 Wow, what a great idea for another way to use your Seaside table runner pattern! Thank you for always sharing and inspiring. Beautiful work!